How could it not be with awe inspiring landscapes from corner to corner? Do not be fooled, the success of cycling in Oregon is no accident. Passionate cyclists, dedicated community advocates and visionary agencies work to welcome cyclists from around the world in ways that strength economic vitality across the state. Beauty is the obvious reason people come to Oregon to bicycle but the hard work to connect cyclists to routes can be overlooked. In April Tour de MIKE highlighted Oregon’s world class cycling and statewide network of proponents as it rolled from Springfield to Pendleton for the Governor’s Conference on Tourism. 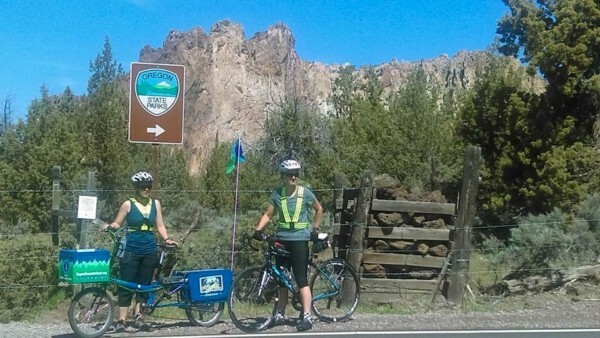 Touching Adventure Cycling’s TransAmerica route and five scenic bikeways the itinerary showcased some of Oregon’s best cycling product. Tour de MIKE celebrated the one year anniversary of the first visitor information center bike created by Travel Lane County. The Mobile Information Kiosk Explorer (MIKE) is a fully functional visitor center that embodies bicycle tourism. Designed to celebrate the sometimes overlooked efforts to build bicycle tourism, Tour de MIKE included a community event each night and local riders joined for portions of the ride. Three riders completed the entire 360 miles and 22,000 feet of elevation with a total of twenty six riders joining for portions of the ride. Riders represented Travel Lane County, The Mt Hood Territory, State Parks, Cycle Oregon and Travel Oregon along with local ride clubs and Scenic Bikeway proponents. Successful bicycle tourism is built by the dedicated work of these individual groups plugging away in their corners of the state. Tour de MIKE illustrated the powerful and inspiring way that bicycle tourism is connected throughout the state bringing representatives of these groups together on the road and in the communities where the work is done and hospitality delivered. Individual communities like Cottage Grove and Estacada with established Scenic Bikeways welcome Fossil and others along the new Painted Hills Scenic Bikeway to the club. These communities know firsthand that when the hard work is done and the Bikeway signs go up it is really just the beginning. The community is now a part of a network promoting the Bikeway to bring cyclists to their town. With hospitality like Pendleton, Heppner, Fossil, Madras, Sisters and McKenzie Bridge rolled out for Tour de MIKE there is no doubt that cyclists from near and far will want to come and stay in Oregon. Oh and it’s also really beautiful here too.